More than 200 case studies were analysed in 11 European countries representing the main European learning cultures: Czech Republic, Cyprus, France, Germany, Ireland, Italy, Lithuania, The Netherlands, Norway, Switzerland and the United Kingdom. The analysis showed that this goal was served by working both top-down as well as bottom-up. The bottom-up approach made the specific needs for lifelong learning on the labour market in different sectors visible. The ‘top-down’ data showed the various services national and sectoral learning systems are already offering to or designing for the potential users, for example the modern, lifelong learning workers. The underlying principle of lifelong learning is that initial education is no longer enough for a lifetime social-economic career. It is more important to develop your competencies (skills, knowledge, attitude & ambitions) throughout life by realizing that ‘your glass is already half full’, and by understanding that everyone always learns in every possible learning environment: formal (school) and non-formal or informal environments (working place, at home). The Leonardo-project “Managing European diversity in lifelong learning (VPL2)” aimed at strengthening the use of valuation & validation of non-formal and informal learning for both summative and formative purposes in a qualitative and quantitative sense: more use of the validation of non-formal and informal learning by individuals and organisations, supported by a more demand-led and customer-oriented learning system. 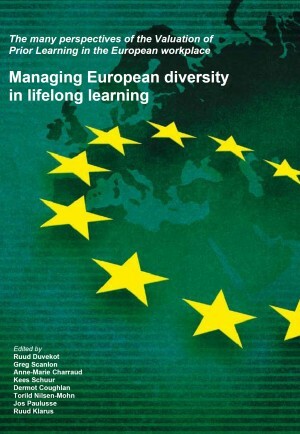 The VPL-evidence in this project shows the diversity in lifelong learning across Europe indicating where the common features prevail and where one learning culture can learn from another. The main result of the project is the creation of role models in the workplace; showing that lifelong learning is possible in any context, country and culture; and that there are always shared elements that make it possible to make a manageable tool for lifelong learning out of the valuation & validation-principles. This book was written by the partners in this project. This project has been carried out with the financial support of the Leonardo da Vinci programme of the European Commission.